Job creation and falling unemployment are always good news, never more so than when a country is still reeling from the effects of its worst economic crisis in 80 years. 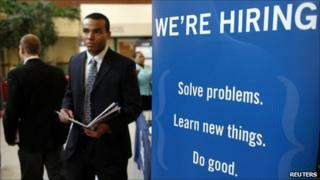 So it seems churlish to quibble with the cheers that met the latest US jobs report. But there's no doubt that for all the new signs of strength in the US job market, there is still a major unemployment problem in America, one that still blights the lives of millions and could yet prove to be the single biggest factor in US politics over the next two years. If you look beneath the "strong" numbers that headline April's jobs reports you quickly find plenty of other, distinctly weaker numbers. Like all developed economies the United States has arrived at its method of counting the people who aren't working over many years and via some controversial choices. As a consequence the new and distinctly improved headline unemployment rate of 8.8% is in fact rather a narrow measure. To be counted among the 8.8% you have to be out of work and have actively looked for a job in the past four weeks. What that means is that many people who have simply given up looking for work in a jobs markets worse than even their grandparents can remember, are not actually being counted as "unemployed". Don't worry, they are still captured in the government statistics, they just get labelled as weird things like "marginally attached" or "discouraged" workers. So if you're "discouraged" as well as being out of work you don't get counted among the unemployed. Your place in the survey is among the government's "alternative measures of labor underutilisation". Such awful jargon is of course unemployment to anyone who experiences it, and to those of us who speak English not economese. And if you take the widest such measure of "labor underutilisation", which basically counts everyone who doesn't have a full time job, and blames that on economic reasons (as opposed to being sick or in training) then, currently you get a rate of 15.7%. What that means is that nearly one in six of the people in America who may want to work full time can't find a job. Whatever the good news this month, it's still clearly an economy with a huge unemployment problem. That's a major headache for President Barack Obama. When he looks beneath the headline numbers of the jobs report, what he sees is a jobless rate that may be falling; it just is not falling quickly enough to secure his own future employment. The president will be acutely aware of the fact that since Franklin Roosevelt was in the White House, the highest unemployment rate that a president has presided over and managed to get re-elected to a second term in office is 7.2%. That was in 1984 when Ronald Reagan won a second term in the White House. In other words, the "good news" in the latest job report, needs to be repeated each month for the next 18 months or President Obama could be out of a job. No wonder the president reacted to the news on jobs by saying "more work needs to be done". Then there's the matter of what kind of jobs are now being created. The monthly jobs report does not delve too deeply into this subject, but other organisations have. In February, the National Employment Law Project (NELP) published research which showed that the new jobs appearing in America generally aren't as good as the ones that got lost. NELP found that jobs in lower wage industries, such as retail and food preparation, made up 23% of the jobs that were lost in the recent recession. However they made up 49% of the jobs that the economy has gained in the last year. Similarly, only 14% of the new jobs in the US economy, as of February, were in the so-called "higher-wage" industries. In other words, it appears what that while people may finally be returning to work, they have to work for less pay. If it continues this trend will be profoundly worrying for economists and policy makers, and not just in the US. Well-paid jobs are of course the basis of America's middle class. That middle class, with all of its spending power has been the bedrock of the US economy for decades. It has also been one of the great drivers of economic growth around the world. After all, most countries whose wealth is built on exports are selling to the American middle class. If the wealth of that class is eroded by a decline in the quality of its jobs, then eventually that spells hardship for people far beyond America's shores.